Our crowdfunding campaign has ended, but you can still support the Visual and Performing Arts Education Program by clicking here. Hello! The 2018 VAPAE Spark campaign has ended, but you can still support the program, artists, and educators by clicking here to make a donation. Thank you for your ongoing support! The arts are essential to educational justice. Learning thrives in diverse creative communities. Arts education transforms individuals and society. With the goal of being a catalyst for positive change in urban arts education, the mission of the Visual and Performing Arts Education (VAPAE) Program in the School of the Arts and Architecture is to expose UCLA undergraduates to the rich history of arts education in the U.S. and to highlight its role in a diverse society. VAPAE’s Afterschool Arts & Arts Enrichment Programs provide local K-12 students supportive and constructive in-school arts programs and out-of-school arts activities, through a variety of arts disciplines, including dance, theatre arts, music, photography, visual arts, and multidisciplinary creativity sessions. 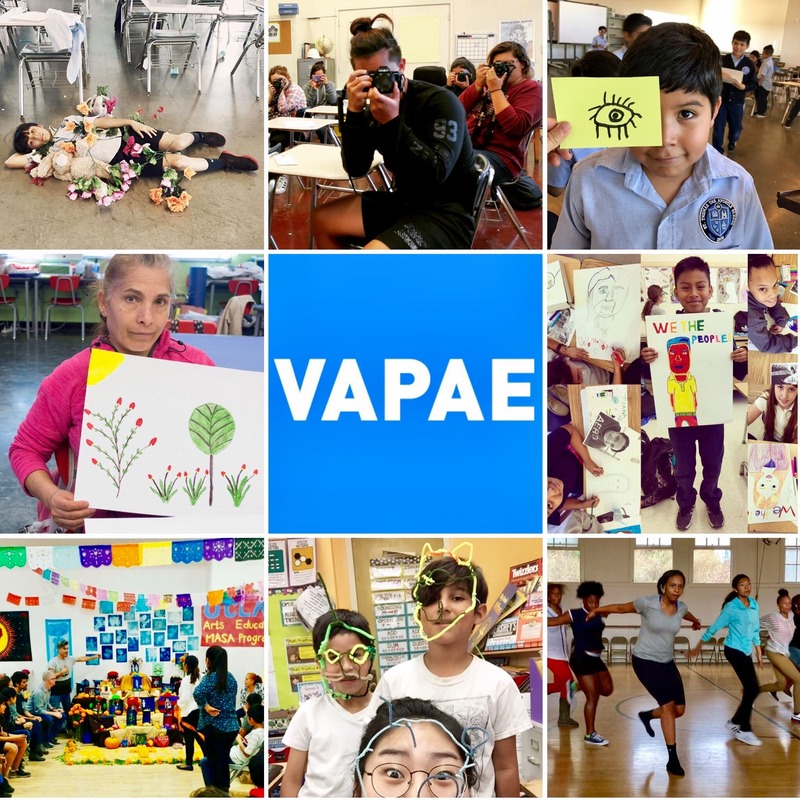 VAPAE arts programs are taught by passionate UCLA undergraduates and recent alums, trained by VAPAE professors through experiential coursework, and now, dedicated to using the arts as a tool for creative expression, self empowerment, social justice, and educational equity. In response to the pressing needs in our local schools and communities, VAPAE has stepped up its commitment to placing undergraduates in UCLA-affiliated TIE-IN schools and Title I LAUSD schools that are primarily located in underserved communities throughout Los Angeles. Through its innovative interdisciplinary arts programs, VAPAE provides UCLA students with the experiential opportunities needed to develop into qualified teaching artists, while introducing them to a range of possible careers in the arts. Research shows that high quality arts classes and arts enrichment programs, both during school and out-of-school times, provide K-12 students with the tools they need to develop as artists and productive community members. VAPAE understands that high quality arts education prepares students with crucial 21st century skills, what we call the 6 C’s: communication, creativity, critical thinking, collaboration, cultural awareness and community engagement. 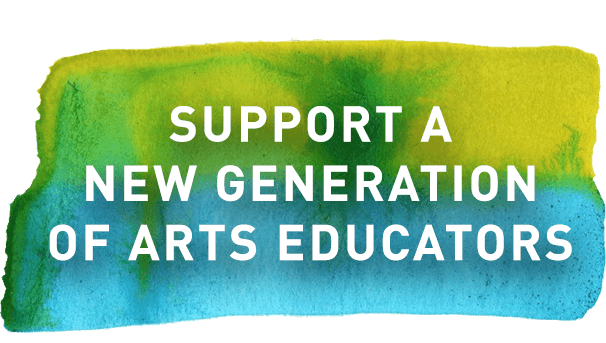 VAPAE believes that arts education is an issue of social justice and a civil right and that high quality arts education is a crucial component to every child's complete education. 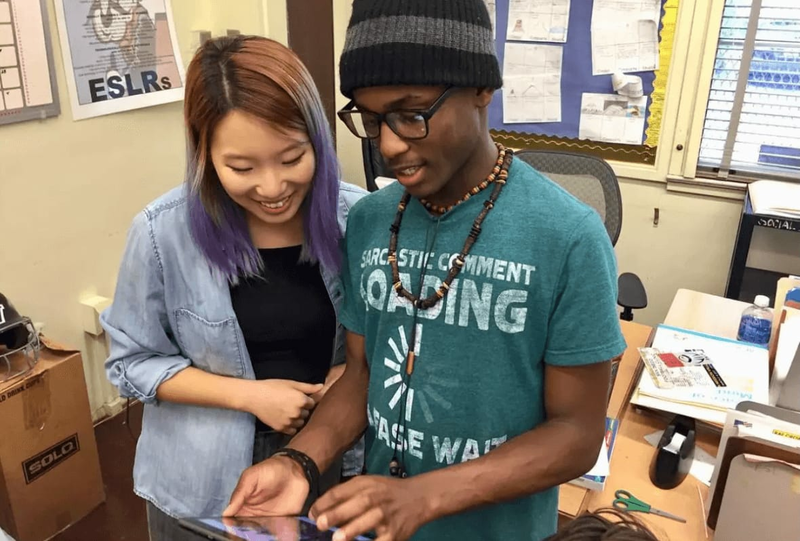 Help us by funding the necessary materials and tools that UCLA undergraduates need to develop into the next generation of artists and community leaders and to positively impact local K-12 students. Your support will ensure that all students grow as individuals and community members through rich artistic experiences taught by VAPAE-trained Teaching Artists, while finding inspiration in their everyday surroundings, gaining a broader view of what art can be. Since its inception in 2010 VAPAE has directly and indirectly impacted over 30,000 people in the Los Angeles area. 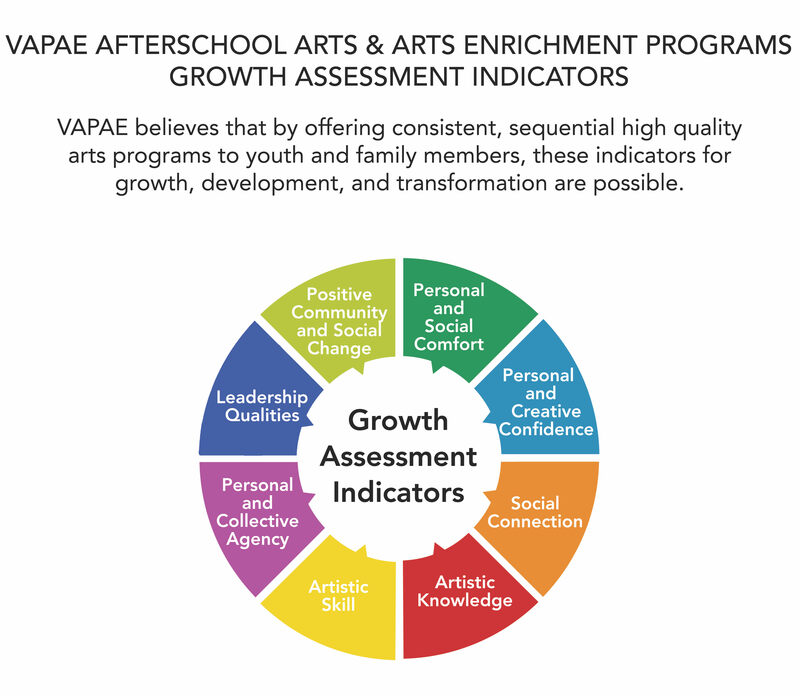 In this 2017-2018 academic year, VAPAE Afterschool Arts and Arts Enrichment Programs are being offered at 12 school and community sites, reaching over 1,000 local K-12 students and their families. 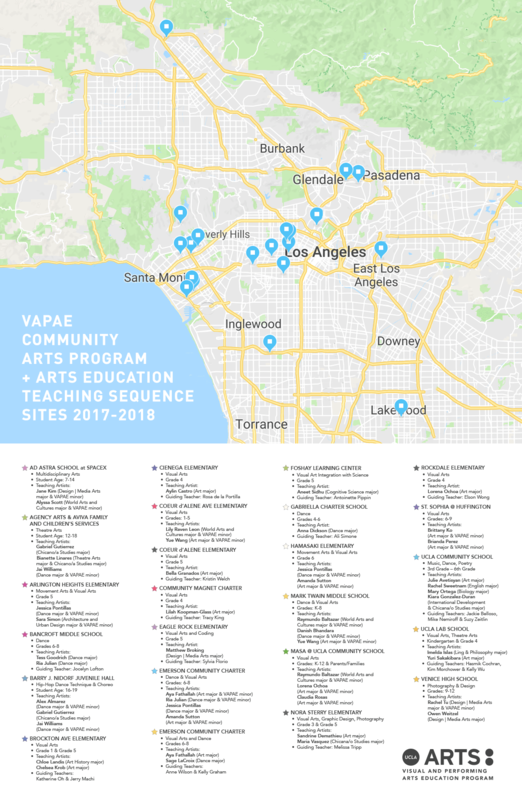 In these programs, VAPAE will provide more than 4,500 hours of sustained arts instruction in a variety of disciplines, free of charge, to all K-12 participants in the Los Angeles Area—from Westwood to Venice to South Los Angeles to East Los Angeles. In addition, this year 24 UCLA undergraduates will complete the Arts Education Teaching Sequence- a rare opportunity to design and implement original arts-based lessons in underserved K-12 schools. Through this sequence, 19 credentialed classroom teachers at 13 urban school sites act as Guiding Teachers, providing guidance and supervision in their assigned classrooms. With an average of 35 pupils per classroom, approximately 840 K-12 students in Los Angeles will receive arts instruction from VAPAE Teachers. Arts lessons they would otherwise not receive. Gifts of any amount are welcomed and appreciated! To understand how these donations will be used, see the donor levels. With each one, reach one. Do you have drawing pencils? Help us provide studio-quality drawing pencils to each participant of our afterschool programs. Every quarter, hundreds of drawing pencils help students practice their techniques while our programs are on hiatus. Paint brushes are very important for our Afterschool Arts Programs. Help us to provide every student with a new set of brushes at the start of each program. A clean brush makes Teaching Artists happy! Let's be honest - paints, markers, clay, and pastels can be really messy. In fact, on many days, it gets dirty! And every drip and spill matters, so as a part of every art-making lesson, all participants of VAPAE's afterschool arts programs learn the importance of keeping a clean studio space. VAPAE Afterschool Arts Programs often design and print class T-shirts, either as a visual art project, or to be used as costumes for dance or theater performances, which can greatly increase a sense of wellbeing and belonging. For dance or theater programs, Teaching Artists use physical props to facilitate learning. Your donation can be used to support performing arts teachers deepen the experience of young people and enliven their imaginations. Exceptional artwork is worth keeping! Help VAPAE preserve the amazing works created by our gifted students. Once framed, and added to VAPAE's digital archive, works of art can either be donated to the school site for permanent display or given to the artist who created it. Teaching Artists utilize their tools to teach, demonstrate and create artwork on a weekly basis. That's a lot of wear-and-tear! Help Teaching Artists conserve their supplies by allowing VAPAE to purchase their tool kits in advance. Your investment will allow a Teaching Artist to maximize their materials, while helping VAPAE build their own inventory of art supplies. Help us celebrate the achievements of an afterschool arts program by sponsoring a culminating event. Be it a rehearsed performance, a film project, a small-scale gallery opening, or full exhibition, culmination provides the rare opportunity for family and friends to celebrate the students' work. Your contribution will go towards hosting this important gathering, as well as, provide personalized certificates for all students who complete a VAPAE Afterschool Arts Program, to be presented at the Culmination Event. For VAPAE, Community Engagement works multi-directionally. We support UCLA undergraduates as they go into the community to teach art, and are committed to bringing our community partners to our UCLA campus to experience the vibrant campus life and arts culture we are so proud of. Renting school buses or other transportation costs is costly, but worth it, when creating a transformative experience for local youth. Trips to our campus can be a turning point in the lives of a young person who might not otherwise have a chance to visit UCLA; it may even be the a-ha moment when a youth begins to imagine themselves one day becoming a Bruin! In the schools and communities that VAPAE serves, our students thrive when they are well-nourished and ready to create. Your gift will help provide healthy snacks, as well as, paintbrushes, paper, glue, scissors, pencils, camera film, and other art materials, for the students participating in a VAPAE afterschool arts program over the course of an entire school year. Make a significant investment in arts education for students from underserved communities. This contribution will help fund a 10-week VAPAE afterschool arts program or an arts enrichment program at a Los Angeles public school or community center. From teaching artists to supplies to snacks, your gift will provide everything needed to help dozens of students develop their own artistic identity and creative confidence.